I have to record this ongoing discussion from G+, it’s too interesting. Shall do it from my subjective viewpoint, be free to comment on this, either here or in the original place. Further I shall only lightly edit the content of the discussion (for example by adding links). “I will argue that it is a category mistake to regard mathematics as “physically real”.” Very interesting post by Louis Kauffman: Mathematics and the Real. Discussed about it here: Mathematics, things, objects and brains. Greg Egan‘s “Permutation City” argues that a mathematical process itself is identical in each and any instance that runs it. If we presume we can model consciousness mathematically it then means: Two simulated minds are identical in experience, development, everything when run with the same parameters on any machine (anwhere in spacetime). > […] cited in a 2003 Scientific American article on multiverses by Max Tegmark. That is why, instead of boasting against this ideology and jumping to consciousness (which I think is something which will wait for understanding sometimes very far in the future), I prefer to offer first an alternative (that’s GLC, chemlambda) which shows that it is indeed possible to do anything which can be done with these ways of thinking coming from the age of the invention of the telephone. And then more. After, I prefer to wonder not about consciousness and it’s simulation, but instead about vision and other much more fundamental processes related to awareness. These are taken for granted, usually, and they have the bad habit of contradicting any “bit”-based explanation given up to date. +Peter Waaben that’s easy to reply, by way of analogy with The short history of the rhino thing . Is the past real? Is the rhinoceros horn on the back real? Durer put a horn on the rhino’s back because of past (ancient) descriptions of rhinos as elephant killers. The modus operandi of that horn was the rhino, as massive as the elephant, but much shorter, would go under the elephant’s belly and rip it open with the dedicated horn. For centuries, in the minds of people, rhinos really have a horn on the back. (This has real implications, alike, for example, with the idea that if you stay in the cold then you will catch a cold.) Moreover, and even more real, there are now real rhinos with a horn on the back, like for example Dali’s rhino. I think we can safely say that the past is a thing, and any of this thing reifications are very real. +Peter Waaben, that seems what the dust hypothesis suggests. +Marius Buliga, i’m still digesting, could you rephrase “- no use of evaluation” for me? But yes, practical is good! +Refurio Anachro concretely, in the model of computation based on lambda calculus you have to add an evaluation strategy to make it work (for example, lazy, eager, etc). The other model of computation, the Turing machine is just a machine, in the sense that you have to build a whole architecture around to use it. For the TM you use states, for example, and the things work by knowing the state (and what’s under the reading head). Even in pure functional programming, besides their need for an evaluation strategy, they live with this cognitive dissonance: on one side they they rightfully say that they avoid the use of states of the imperative programming, and on the other side they base their computation on evaluation of functions! That’s funny, especially if you think about the dual feeling which hides behind “pure functional programming has no side effects” (how elegant, but how we get real effects from this?). In distinction from that. in distributed GLC there is no evaluation needed for computation. There are several causes of this. First is that there are no values in this computation. Second is that everything is local and distributed. Third is that you don’t have eta reduction (thus no functions!). Otherwise, it resembles with pure functional programming if you see the core-mask construction as the equivalent of the input-output monad (only that you don’t have to bend backwards to keep both functions and no side effects in the model). [My comment added here: see behaviour 5 of a GLC actor explained in this post. Among the effects is that it goes outside the lambda calculus (the condition to be a lambda graph is global), which simplifies a lot of things, like for example the elimination of currying and uncurrying. Another effect is that is also very much like automaton kind of computation, only that it is not relying on a predefined grid, nor on an extra, heavy handbook of how to use it as a computer. On a more philosophical side, it shows that it is possible to do what the lambda calculus and the TM can do, but it also can do things without needing signals and bits and states as primitives. Coming back a bit to the comparison with pure functional programming, it solves the mentioned cognitive dissonance by saying that it takes into account the change of shape (pattern? like in Kauffman’s post) of the term during reduction (program execution), even if the evaluation of it is an invariant during the computation (no side effects of functional programming). Moreover, it does this by not working with functions. +Marius Buliga “there are no values in this computation” Not to disagree, but is there a distinction between GLC graphs that is represented to a collection of possible values? For example, topological objects can differ in their chromatic, Betti, genus, etc. numbers. These are not values like those we see in the states, signals and bits of a TM, but are a type of value nonetheless. +Stephen Paul King yes, of course, you can stick values to them, but the fact is that you can do without, you don’t need them for the sake of computation. The comparison you make with the invariants of topological objects is good! +Louis Kauffman made this analogy between the normal form of a lambda term and such kinds of “values”. I look forward for his comments about this! +Refurio Anachro thanks again for the Permutation city reference. Yes, it is clearly related to the budding Artifficial Connectomes idea of GLC and chemlambda! It is also related with interests into Unlimited Detail 🙂 , great! The Autoverse is an artificial life simulator based on a cellular automaton complex enough to represent the substratum of an artificial chemistry. It is deterministic, internally consistent and vaguely resembles real chemistry. Tiny environments, simulated in the Autoverse and filled with populations of a simple, designed lifeform, Autobacterium lamberti, are maintained by a community of enthusiasts obsessed with getting A. lamberti to evolve, something the Autoverse chemistry seems to make extremely difficult. Related explorations go on in virtual realities (VR) which make extensive use of patchwork heuristics to crudely simulate immersive and convincing physical environments, albeit at a maximum speed of seventeen times slower than “real” time, limited by the optical crystal computing technology used at the time of the story. Larger VR environments, covering a greater internal volume in greater detail, are cost-prohibitive even though VR worlds are computed selectively for inhabitants, reducing redundancy and extraneous objects and places to the minimum details required to provide a convincing experience to those inhabitants; for example, a mirror not being looked at would be reduced to a reflection value, with details being “filled in” as necessary if its owner were to turn their model-of-a-head towards it. But I keep my claim that that’s enough to understand for 100 years. Consciousness is far away. Recall that first electricity appeared as kind of life fluid (Volta to Frankenstein monster), but actually it has been used with tremendous success for other things. This is a suggestion for using a GLC actors computation ( arXiv:1312.4333) which is easy and it has a nice biological feeling. 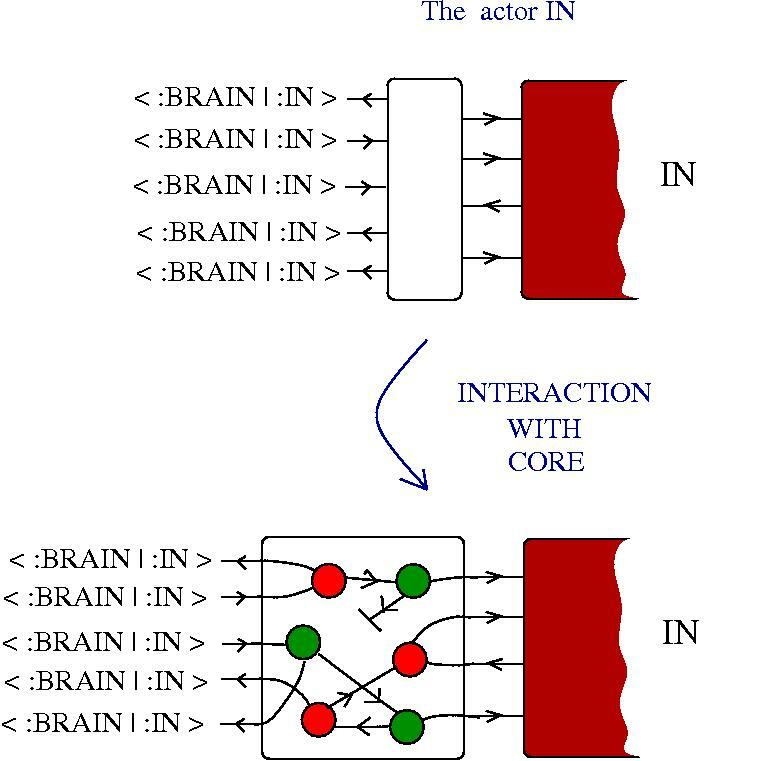 the brain is a network of actors which start to interact with the IN actor (after the interaction with cores). 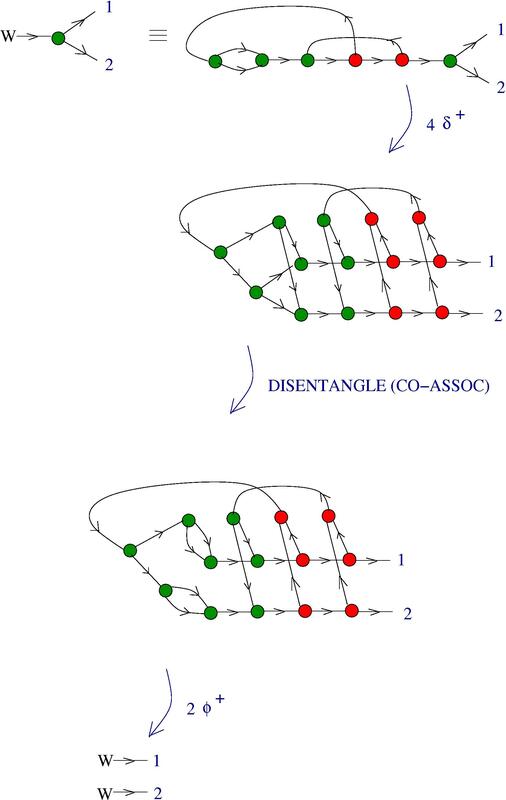 These interactions can be of any kind, but I think mainly as interactions by graph reduction. 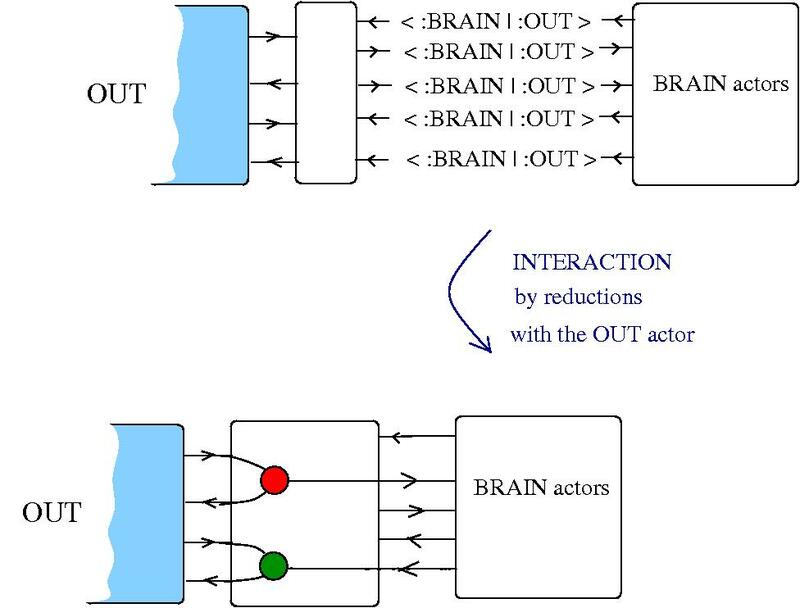 the effectors are modelled as a OUT actor. 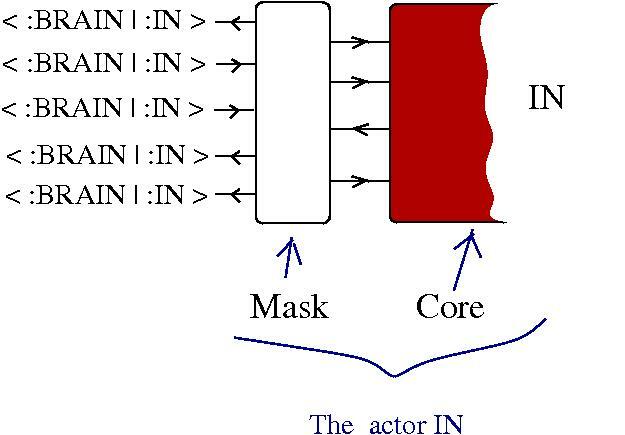 This actor has also a core, which is the outside medium which is changed by the GLC computation. 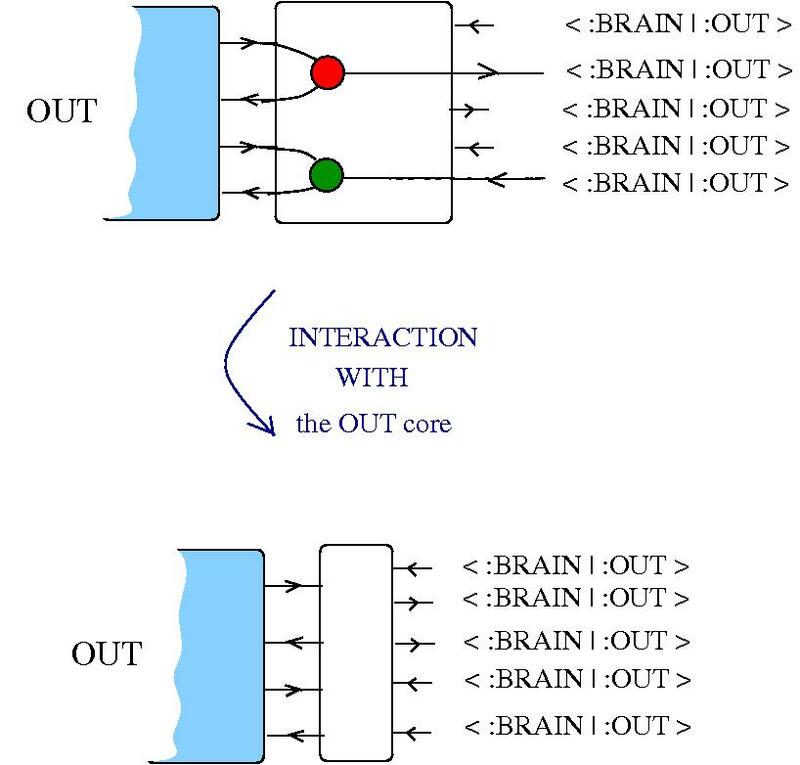 At a certain point in the computation the brain actors interact (by graph reductions) with the OUT actor and the result of the computation is again an interaction with cores. This time in the OUT actor. It is like the OUT actor deposit the result of the computation in it’s core. The red-green graph has no meaning, is just a graph in the chemlambda drawing convention. 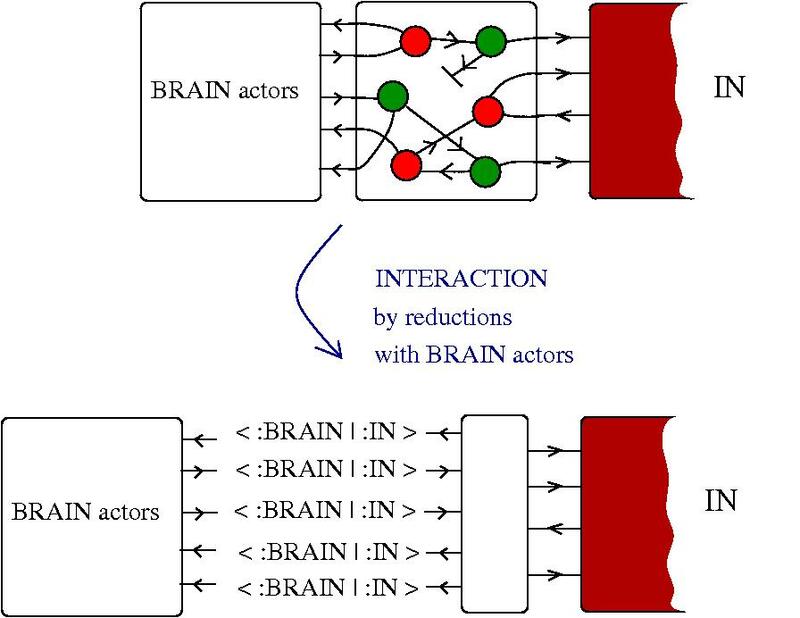 … followed by interactions between the brain actors. This is where the bulk of the computation is done. 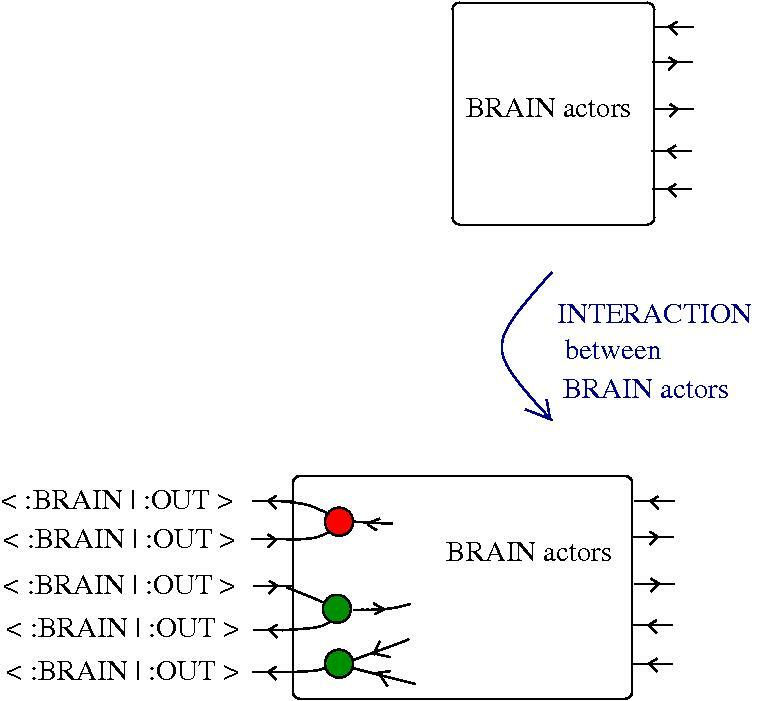 This computation sets the stage for interactions between the Brain actors and the OUT actor. and the OUT actor does something like writing data (in it’s core). Finally, the whole architecture has to be designed such that what has been described works by it’s own, without any external control. UPDATE: Clearly needed a mix of the ActorScript of Carl Hewitt with GLC and chemlambda. Will follow in the months to come! Thinking out loud about a variant of the actor model (chapter 3 here), which uses graphic lambda calculus or the chemical concrete machine. The goal is to arrive to a good definition of an Artificial Chemical Connectome. Have remarks? Happy to read them! with a behaviour, to be specified further. Remark: the numbers could be uniformly bounded to 2, or 4, or 6, according to user’s wishes. Take a look at the Ackermann machine, for inspiration. Chemical concrete machine. Marius Buliga. figshare. 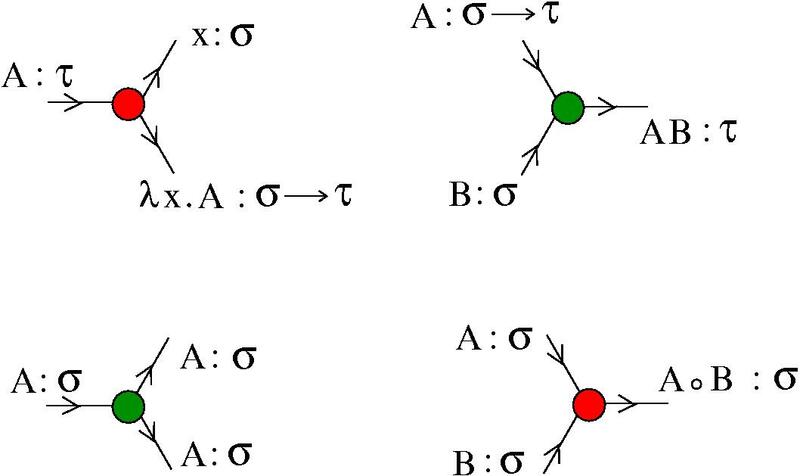 This article introduces an artificial, algorithmic chemistry based on local graph rewrites applied to a class of trivalent graphs named molecules. The graph rewrites are seen as chemical reactions with enzymes. The enzymes are tagged with the name of the respective move. This artificial chemistry is Turing complete, because it allows the implementation of untyped lambda calculus with beta reduction (but without eta reduction). This opens the possibility to use this artificial chemistry for constructing artificial chemical connectomes. and some more articles with the chemical concrete machine tag. The article is available also as arXiv:1309.6914 [cs.FL]. This is a continuation of the post WWW with Metabolism . That post, in a nutshell, propose to endow the internet connectome with a chemical connectome, by using an artificial chemistry for this artificial network, namely the graphic form of the lambda calculus formalism of the chemical concrete machine (please go read the mentioned post for details). I’m going to do a weird, but maybe instructive thing and pretend that it already happened. Why? Because I intend to argue that the internet with a chemical connectome might be a good laboratory for testing ideas about real brains. Focusing solely on neuronal electrical activity is shortsighted if the goal is to understand information processing in brains. Brain function integrally entails complex synaptic chemistries. […] New tools fuel fundamentally new conceptualizations. By and large, today’s approaches for sensing neurotransmitters are not able to approach chemical neurotransmission at the scales that will ultimately be important for uncovering emergent properties. Likewise, most methods are not highly multiplexed suchthat the interplay of multiple chemical transmitters can be unraveled. In addition to measuring electrical activity at hundreds or thousands of neurons simultaneously, we need to advocate for a large-scale multidisciplinary effort aimed at in vivo nanoscale chemical sensing. Imagine then we already succeeded with implementing a (logical, artificial, human made) chemical connectome over the internet, by using CS tools and exploiting the relative simplicity of ingredients of the internet (connected Von Neumann machines which exchange data through known formats and programming languages). We could explore this chemical connectome and we could play with it (because we defined it), even if, like in the case of the brain connectome, we can’t possibly know the www network in all details. So, we should be in a situation which is extremely complex, like a brain is, but however allows for very powerful experimentation, because is still human made, according to human rules. … they know surprisingly much, according to the choice of definition of “neural knowledge”. The concrete definition which I adopt is the following: the knowledge of a neuron at a given moment is the collection (multiset) of molecules it contains. The knowledge of a synapse is the collection of molecules present in respective axon, dendrite and synaptic cleft. the neural network is physically described as a graph with nodes being the neurons and arrows being the axon-dendrite synapses. The network is built from two ingredients: neurons and synapses. Each synapse involves three parts: an axon (associated to a neuron), a synaptic cleft (associated to a local environment) and a dendrite (associated to a neuron). Each of the two ingredients of a neural network, i.e. neurons and synapses, as described previously, function by associated chemical reaction networks, involving the knowledge of the respective ingredients. (the most simplifying hypothesis) all molecules from the knowledge of a neuron, or of a synapse, are of two kinds: elements of or enzyme names from the chemical concrete machine. The last hypothesis seem to introduce knowledge with a more semantic flavour by the backdoor. That is because, as explained in arXiv:1309.6914 , some molecules (i.e. 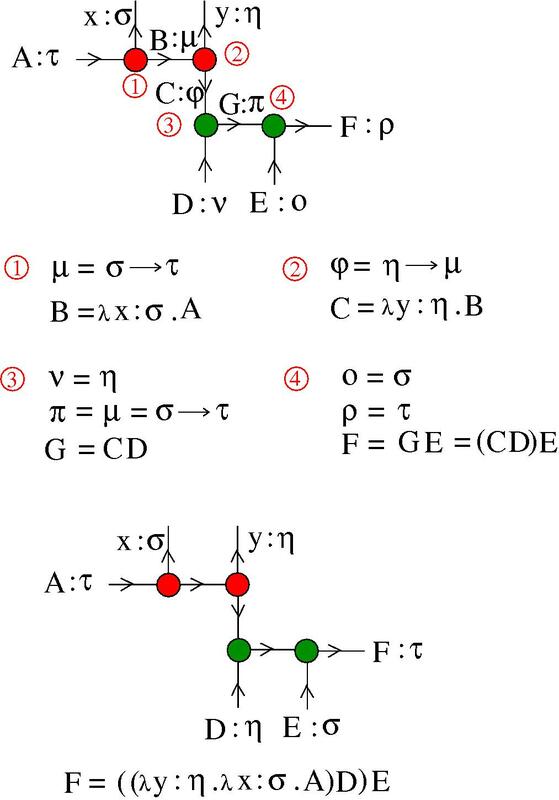 trivalent graphs from the chemical concrete machine formalism) represent lambda calculus terms. So, terms are programs, moreover the chemical concrete machine is Turing universal, therefore we end up with a rather big chunk of semantic knowledge in a neuron’s lap. I intend to show you this is not the case, in fact a neuron, or a synapse does not have (or need to) this kind of knowledge. Before giving this explanation, I shall explain in just a bit more detail how the wet neural network, which satisfies those hypotheses, works. A physical neuron’s behaviour is ruled by the chemistry of it’s metabolic pathways. By the third hypothesis these metabolic pathways can be seen as graph rewrites of the molecules (more about this later). As an effect of it’s metabolism, the neuron has an electrical activity which in turn alters the behaviour of the other ingredient, the synapse. 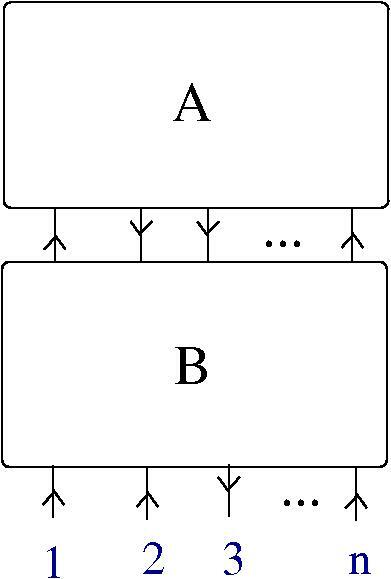 In the synapse act other chemical reaction networks, which are amenable, again by the third hypothesis, to computations with the chemical concrete machine. As an effect of the action of these metabolic pathways, a neuron communicates with another neuron. In the process the knowledge of each neuron (i.e. the collection of molecules) is modified, and the same is true about a synapse. As concerns chemical reactions between molecules, in the chemical concrete machine formalism there is only one type of reactions which are admissible, namely the reaction between a molecule and an enzyme. 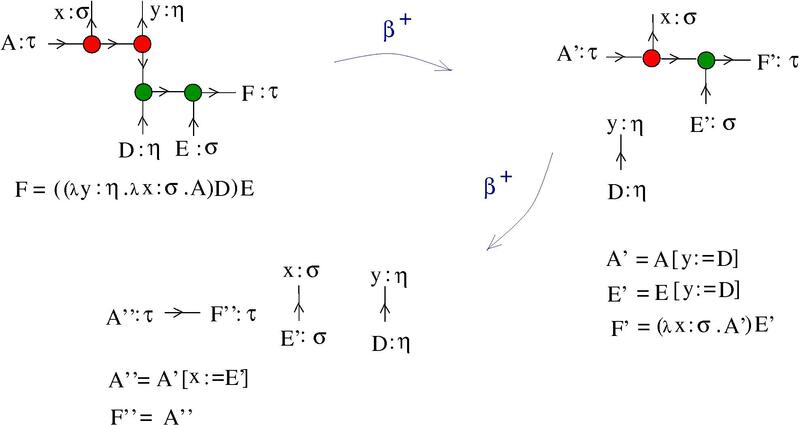 Recall that if (some of the) molecules are like lambda calculus terms, then (some of the) enzymes are like names of reduction steps and the chemical reaction between a molecule and an enzyme is assimilated to the respective reduction step applied to the respective lambda calculus term. where $\latex A$ and are molecules such that by taking an arrow from and another arrow from we may apply the enzyme and produce the SWITCH move for this pair of arrows, which results in new molecules and (and possibly some GARBAGE, such as loops). In conclusion, for this part concerning possible chemical reactions between molecules, we have enough raw material for constructing any chemical reaction network we like. Let me pass to the semantic knowledge part. Semantic knowledge of molecules. This is related to evaluation and it is maybe the least understood part of the chemical concrete machine. As a background, see the post Example: decorations of S,K,I combinators in simply typed graphic lambda calculus , where it is explained the same phenomenon (without any relation with chemical metaphors) for the parent of the chemical concrete machine, the graphic lambda calculus. 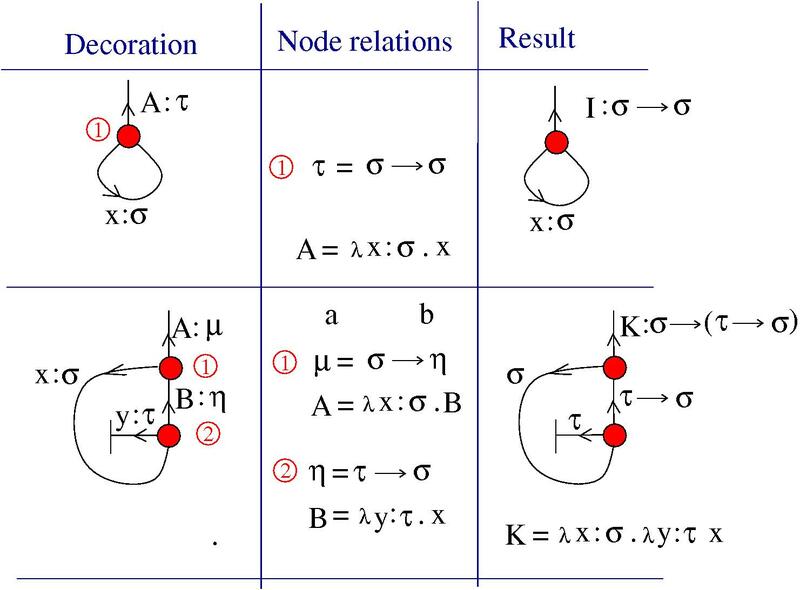 If we consider decorations of combinator molecules, then we obtain the right type and identification of the corresponding combinator, like in the following example. For combinator molecules, the “semantic knowledge”, i.e. the identification of the lambda calculus term from the associated molecule, is possible. In general, though, this is not possible. Consider for example a 2-zipper molecule. We obtain the decoration as a nested expression of , which enough for performing two beta reductions, without knowing what mean (without the need to evaluate ). 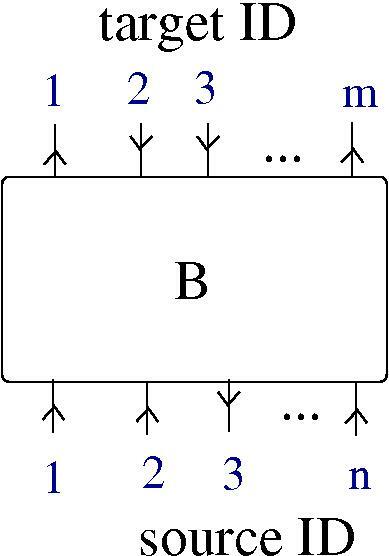 This is equivalent with the property of zippers, to allow only a certain sequence of graphic beta moves (in this case two such moves). Here is the tricky part: if we look at the term then all that we can write after beta reductions is only formal, i.e. reduces to , with all the possible problems related to variable names clashes and order of substitutions. We can write this reduction but we don’t get anything from it, it still needs further info about relations between the variables and the terms . However, the graphic beta reductions can be done without any further complication, because they don’t involve any names, nor of variables, like , neither of terms, like . the terms or variables decorations (names elsewhere “places”) change globally. We indicate this global change like in the following figure, which is the result of the sequence of the two possible moves. Therefore, after the first graphic beta reduction, we write to indicate that is the new, globally (i.e. with respect to the whole graph in which the 2-zipper is a part) obtained decoration which replaces the older , when we replace by . After the second graphic beta reduction we use the same notation. 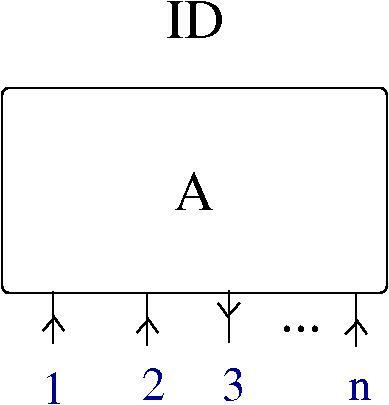 But such indication are even misleading, if, for example, there is a path made by arrows outside the 2-zipper, which connect the arrow decorated by with the arrow decorated by . We should, in order to have a better notation, replace by , which gives rise to a notation for a potentially infinite process of modifying . So, once we use graphs (molecules) which do not correspond to combinators (or to lambda calculus terms), we are in big trouble if we try to reduce the graphic beta move to term rewriting, or to reductions in lambda calculus. In conclusion for this part: decorations considered here, which add a semantic layer to the pure syntax of graph rewriting, cannot be used as replacement the graphic molecules, nor should reductions be equated with chemical reactions, with the exception of the cases when we have access to the whole molecule and moreover when the whole molecule is one which represents a combinator. So, in this sense, the syntactic knowledge of the neuron, consisting in the list of it’s molecules, is not enough for deducing the semantic knowledge which is global, coming from the simultaneous decoration of the whole chemical reaction network which is associated to the whole neural network.